Many times when people think of debt and those that are in debt, they assume the amounts are quite large, when in fact, there are thousands of people out there who are struggling with smaller debt. Small debt may not sound like a big deal, but it can be tough on those earning just enough to pay it off. A good example are student loans. Students, in fact, aren’t borrowing hundreds of thousands of dollars for graduate school. In fact, less than 2% borrow over $50,000. Rather, the average amount owed is around $15,000. Indeed, 3.2 million students who borrowed around this amount defaulted on their loans. 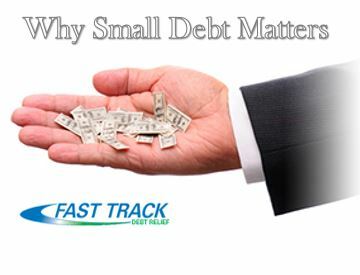 So debt, even when it seems small, can be a big deal and lead to the need for debt management, as well as credit repair. It can be difficult, knowing that a small amount has been borrowed and then discovering it’s so difficult to pay back. The same can be applied to just about any loan or debt. It begins as a good idea – sometimes a great idea – and perhaps you don’t ever think you’re going to need debt management help. But then life strikes and perhaps you find yourself with an unexpected additional financial burden – something often caused by medical bills – and realize that now you can no longer properly pay off your debt, despite how small it may seem. Getting help in such situations is imperative. You need to ensure that you have credit repair assistance so you can continue to have a healthy financial record. Problems with things, such as medical bills, a sudden layoff at work, or other life changes, shouldn’t be detrimental to your financial history. If something should happen, don’t be afraid to talk about it. Start creating goals and do what you can to avoid panicking. Debt management assistance is out there to help take some of the weight off your shoulders, help you make a plan, and get a budget together. You can beat debt – it doesn’t have to beat you.